Hyping the Camino: Slogging into Santiago! Tuesday, May 26, Cathedral in Santiago! 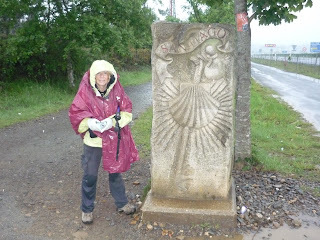 After 31 days of walking, our wet, weary and very squishy entrance into Santiago was more than somewhat of an anti-climax then the grand excited entrance I had invisioned. You would think by now I would learn not to make assumptions. We once again layered up with raincoats, backpack covers, hats and ponchos and left Arca at 6:20am in the pouring rain and the rain didn´t let up all day. I even had rubber gloves over my thermal gloves. 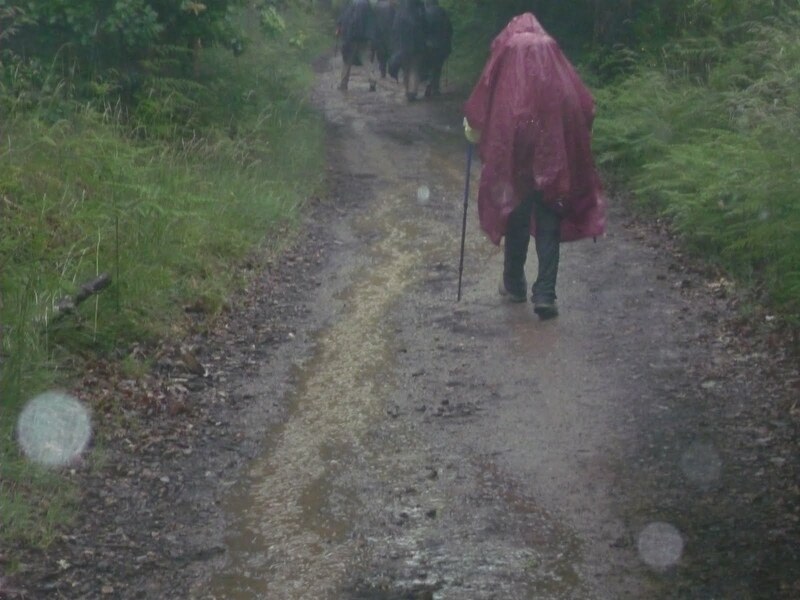 The Gortex water-proofing in my hiking boots surrendered to the rain after the first hour and I spent the next three and a half hours sloshing and slogging my way along the trail. Once again those assumptions I make! Imagine, I assumed that waterproof boots would keep my feet dry. Dayton´s boots weren´t waterproof to start with so his feet were wet even sooner than mine. I can´t describe much of the scenery along the way because the hoods from the poncho and raincoat result in total tunnel vision so I spent the entire morning just looking at my leaking boots. I could have been on the Bruce Trail or in Komoka. There was a steady stream of ponchoed pilgrims slopping their way into Santiago and Dayton made note that every one of them passed us along the way. It was busy enough that there was never a moment of privacy so there was never an opportunity for a much needed pit stop. The only café abierto was around San Marcos and the line up for everything, from the washroom to getting a café or bocadillo, was so long that we just kept going. By this time Dayton´s poncho had ripped to shreds so he just stuffed it in a dumpster and soaked up the rain some more. At Lavacolla pilgrims traditionally wash off the weeks of accumulated dirt and sweat before arriving at the Cathedral but at that point we were so wet that washing would have been superfluous. Just to emphasize how wet it was...I had taped my toes with mefix in the morning and when I took my boots off in Santiago the mefix was floating in my socks! 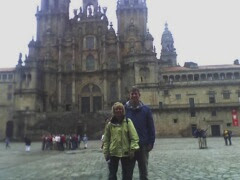 It took about an hour to get from the first sign post on the outskirts of Santiago to the Cathedral. We took a couple of obligatory pictures and headed straight for the line up to get our credentials stamped and our Compostela certificates. The wait was just over one hour! Then we just headed out into the rain again to find our hotel. The Hotel Babantes is ideally located just steps from the Cathedral but I foolishly decided to save some €uros and booked a small rather than large double room. I should have remembered that in Europe small means really, really small. Regardless, it´s luxurious compared to the alberques we´ve been sharing with hundreds of others. And the real bonus is that Dayton discovered we can get CNN in English on our TV not that we really want to get hit with the reality of world crises but it is good to hear English spoken. We had a great ITALIAN dinner at a restaurant right across from our hotel and I´m voting to go there again tomorrow. I actually had spinach- a green vegetable. Other than lettuce it´s the only green vegetable I´ve been served here. So tomorrow, it´s meet people coming into town and we think John will be one of them, go to the Pilgrims´Mass, shop for souvenirs that weigh less than 1/4kg., so no one expect much, and then get our stuff dry enough we hope to head out on our three day walk to Fisterre, the end of the world. Personally, I don´t think those ´big girl underpants´( the ones that are used to get up, get on with it and tough it out) are going to be dried in time. I could have used another day in Santiago and, maybe, if we had planned four days to get to Fisterre, I would have made it. We just got caught up in the challenge of it all and the book said three days so anything less was copping out. Not the right attitude it turns out.